Weeks 28 and 29 We have been very busy working on our M.A.D (Make A Difference) Projects. Visit this LINK to see the timelines that your child has been following to insure his/her M.A.D Project is a success! HomeSHARE– Parents ask to view your child’s project and visit the link above to insure they are following the timelines! Weeks 26 and 27 We are very excited about “Our Favourite Places” project! We have each identified our favourite place in Thunder Bay or the surrounding area. We’ve worked hard to write a descriptive paragraph about our place and capture it through art. Our paragraphs are now pinned to an interactive Google map for our Pen Pals in the UK and other classes throughout the world to enjoy! HomeSHARE– Parents visit our map with your child! Weeks 24 and 25 We have spent the last 2 weeks focusing on letter writing. First we wrote a friendly letter to God for Lent. We also drafted and published letters to our pen pals in the United Kingdom where we focused on writing about our appearance, personality and personal facts. WE worked on using strong descriptive language and our personal voice. We also made Minecraft selfies to compliment our letters. HomeSHARE– Have your child read their letter to you. They used 3 adjectives to describe themselves and their personality. What other adjectives would you use to describe your child? Weeks 22 and 23 We have written many types of non-fiction texts over the past two weeks. To help build our schema on electricity and energy, research and created information posters. We have also worked to completed our digital adventure logs and took jot notes and published our information learned from our latest Google Hangout. Homeshare: Parents have your child share their Electricity/Energy information poster with you. What is the most important or interesting thing(s) he/she has learned? Week 21 Our focus has been to publish our Adventure Logs, based on all of our learning journeys into a digital format. The results have been amazing. Below are some excerpts from some completed Digital Adventure Logs. Weeks 19 and 20 Our inspiration for writing over the past two weeks have been on our Catholic virtues Honesty and Courage. Many poems have also pushed and inspired our writing. We know that strong writing requires the author to dig deep! HomeSHARE Parents, have your child share their writing (based on the prompts below). As authors, did your child “dig deep” or just scratch the surface? 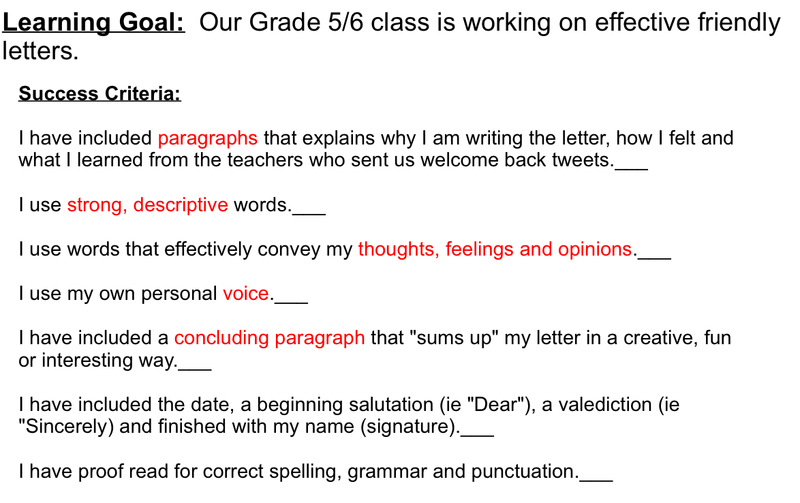 Weeks 17 and 18 We continue to write a lot in grade 5/6 for a wide variety of purposes and audiences. We are working on a non fiction text poster to promote and encourage a happy, healthy lifestyle. We are also working on research reports in Social Studies, have written poem reflections and have written goals for becoming more courageous (some call it a “Bucket List”) in our Guild to Life. We have been discussing and understanding that the more we read, the better writers we become! We also realize that it is important not only to understand our strengths as writers, but also things that we still need to work on to improve. HomeSHARE: Parents, have a conversation with your child. Ask him/her what they think their strengths are as writers. What do they think are some things they think they an improve on? Have you child share with you his/her favourite piece of writing from this year! After our class read and responded to Mr. Peterson’s Blog “Code A Snowflake” our class was inspired to try coding snowflakes ourselves! This simple activity lead us into an 8 day long inquiry on snowflakes. All of our Christian Living, Reading, Writing, Art, Science, Media Literacy and Math was inspired from the snowflake. Read about our incredible inquiry and view the students’ amazing work by visiting: “The Snowflake”. During writing we focused on writing a mini report on snowflakes and retold the nativity story from the perspective of a snowflake, complete with illustrations. HomeSHARE: Parents, your child will be sharing their Snowflake Nativity story with you on Christmas day! Enjoy your Christmas present. Merry Christmas! The students continued to work on their Make A Difference for Christmas projects and are keeping a log of their process in their M.A.D journals.They are working on their plans which they’ll put into action to make a difference before Christmas. HomeSHARE: Parents please ask to see your child’s M.A.D Journal and support them in their quest to make a difference for Christmas. As part of the first Week of Advent, the student brainstormed a number of different ideas that the could do to Make A Difference for others during the Advent season. The are small random acts of kindness to make the lives of others happier. HomeSHARE: Parents talk to your child about what they understand Advent to mean. Have them share how they have “let their light shine”. Share with your child an Advent memory or wish. The students have started their “Passports to the World” and have read A LOT of information while inquiring about three countries of their choice, from three different continents. Their task was to write a brief report on each country and include a map of each nation. HomeSHARE: Have your child share their report(s) with you. Have a discussion about each of the three countries. What are their similarities? Differences? HomeSHARE: Parents have your child share them M.A.D Journal with you. What are your initial reactions? Thoughts? Feelings? The students have continued to use their time writing non fiction text, based on their Science units. They are using a variety of text forms to share their understanding of Human Body Systems and Biodiversity. Students also worked on writing fictional descriptive paragraphs based on their visualizations of the main character, Icabod Crane and the setting in the story Sleeey Hallow. Watch for some iMovies combining their writing, art, and digital media coming soon. HomeSHARE: Parents, have you child share their Google Slide deck on their Science unit with you and/or have them describe either Sleepy Hallow or Icabod Crane. Do you get a good picture in your mind’s eye? The students have spent this week digging into their new Science units:Biodiversity (Grade 6) and The Human Body Grade 5). Mr. C has taught them how to take effective jot notes when researching and then how to effectively communicate their learning using Google Slides. HomeSHARE: Parents have your child share their Google Slide deck with you. Ask them questions to determine how much they’ve learned! We have worked to write for the specific purpose of explaining an idea. The students have spent time reflecting about their One word and have written a paragraph detailing what their word is, why they chose their word and how it will make a difference for themselves and others. HomeSHARE Parents, have your child read their paragraph to you and discuss their goal with them. Can you make any suggestions as to how they can improve their writing? What did you like best about their work? Enjoy! This week we finished publishing our Fall Harvest descriptive paragraphs. We also brainstormed the many things we are thankful for and drafted, edited and published our Thanksgiving prayers. The purpose for writing was to express, in the form of a prayer, the most important things we are grateful for. We worked on using strong descriptive adjectives and used our St. Elizabeth School prayer as a model. The students are looking forward to reading their prayers over the long weekend to their family and friends! We also created word collages using a variety of media forms to share our many blessings. Happy Thanksgiving! I am grateful for my fabulous students and their parents! We have spent much time writing, revising and editing our Fall Harvest descriptive paragraphs! Some of us are still in the process of improving our writing, using the feedback provided to us from both our peers, Mr. C and our parents. Autumn has just submitted her writing (see below). Has she done a good job of writing descriptively, using her five senses, to help YOU experience the beauty of Fort William Historical Park? HomeSHARE: Parents, please have your child share his/her Fall Harvest descriptive writing with you today! 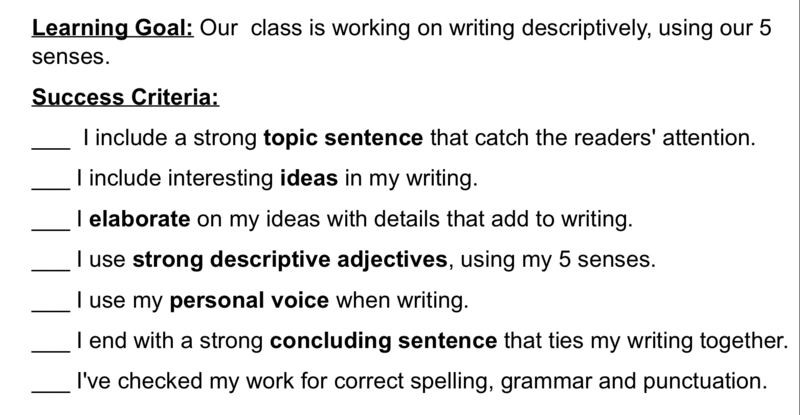 Use Autumn’s paragraph as a good model and the success criteria provided to help your son/daughter improve upon and finalize his/her writing. The final copy is due tomorrow. Enjoy! We worked to finish publishing our personal letters of thanks to teachers from around the globe. Below are two examples. Do they follow the success criteria? HomeSHARE: Have your child share his/her letter with you? Is it complete? Does it follow the success criteria outlined? Can you suggest ideas for improvement? This week students published their avatar descriptive paragraphs and we began to draft personal letters of thanks to all of the amazing teachers and classes who sent us welcome back to school tweets. We are working on developing our personal voice when writing our letters and being aware of the audience we are writing for. HomeSHARE: Parents, see if you can find the avatar that your child created to represent him/herself. Have them explain why they created the avatar they did. Ask to see the letter that your son/daughter has been working on and make suggestions for improvement. We are very much a part of a “ConnectED Classroom”, but Mr.C is trying to teach us that the most important connections are the ones closest to us. Our “Avatar” assignment allowed us to connect with ourselves. We created our own avatars to represent us. Some students chose “life like” characters, while others chose symbols. We are working to write good descriptive paragraphs to explain how our avatars represent us. To help us get to know one another, we’ll be sharing our creations with one another! HomeSHARE: Parents, be sure to ask your child about his/her avatar and ! The following piece of writing accompanies the unicorn avatar….